Koru Kayaking is run by Tom and Hetty Wildblood who offer stunning guided kayak adventures in two of Cornwall’s Areas of Outstanding Natural Beauty. Whether it’s the dramatic north coast, Koru Kayak Adventure kayaking along the St Agnes Coastline or the calm tranquil waters of the Helford River and Frenchman’s Creek, you can really discover Cornwall from a different perspective with Koru. Koru’s north coast Kayak Adventure starts at Trevaunance Cove, St Agnes kayaking through the waves, past the old harbour wall of the bygone mining era – we are in Poldark country. Kayaking into caves, through archways and under waterfalls carved out during the mining era. Bright greens and oranges from exposed copper and iron-ore mines make for a colourful journey. Grey seals, dolphins, sunfish, cormorants and basking sharks have all be spotted on their adventures. The guides are Cornish Mining Ambassadors and Koru Kayaking supports Cornwall Wildlife Trust, Cornwall Seal Group and local wildlife groups and so your knowledgeable guides will bring the coastline to life with their informative commentary. 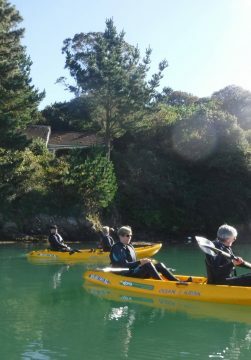 Koru’s Frenchman’s Creek Kayak Adventure launches from the 4 star Budock Vean Hotel on Port Navas Creek. 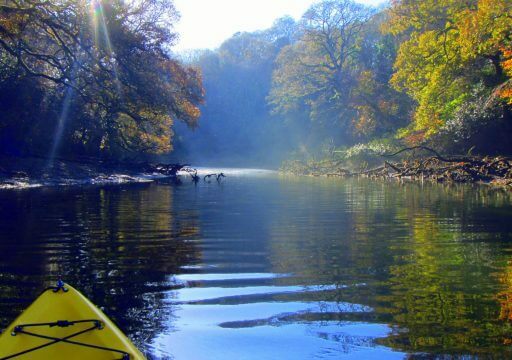 We kayak along Port Navas Creek past the oyster farming, along the ancient oak lined river banks of the Helford River and down Frenchman’s Creek, which was made infamous by Daphne du Maurier’s novel ‘Frenchman’s Creek’. There is even a shipwreck to see on the creek! An abundance of birdlife – herons, egrets, cormorants and kingfishers are all regularly spotted. Your experienced guides will take you past the Royal Duchy Oyster Farm and share information on the oyster and fishing history on the Helford River which started back in 1506 with the Vyvyan family! We use tandem sit on top kayaks. No prior experience required. A full briefing is given before all our kayak adventures and all equipment supplied.